Regular visitors will know already that The Gladiator Project Redux is underway, this time for RMXP. Progress has been slow but steady, so here are several screenshots. In time, I’ll also have a video demo too when there’s much more content and gameplay available. This is the introduction page, which uses Moghunter’s Animated Title Screen (basic version). 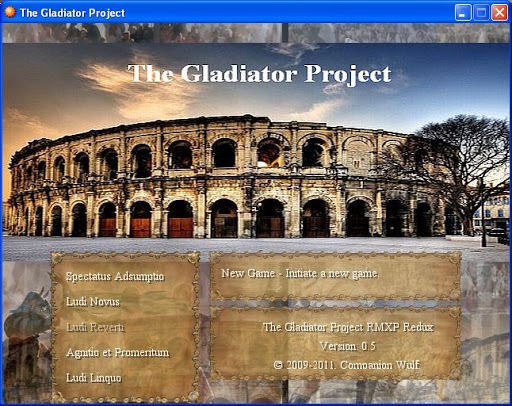 The current layered images are from the movie Gladiator but will change later. 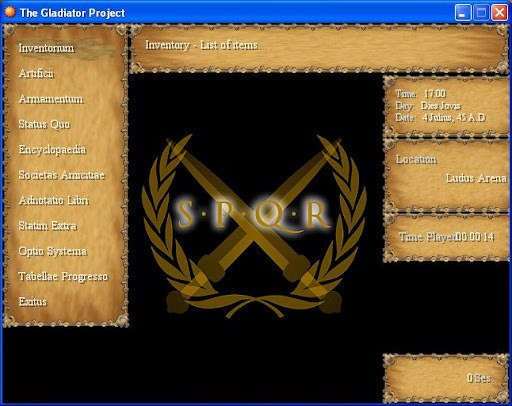 The menu commands are in Latinesque (the term I coined for the pieced-together Latin words), but moving the cursor up and down will display the English translation in the “help” box on the right. The first menu item, Spectatus Adsumptio (Watch Introduction Movie) will display a movie clip – thanks to Berka’s nonpareil Game Film II script – although I may omit it altogether in the final version for two reasons: 1) The current version has clips from commercial movies for which I doubt I’ll get copyrights to use them and 2) The movies may not work on all computers, since they don’t have the same settings or plugins I do to make it work (see the entry at RPG Maker Times FAQ). 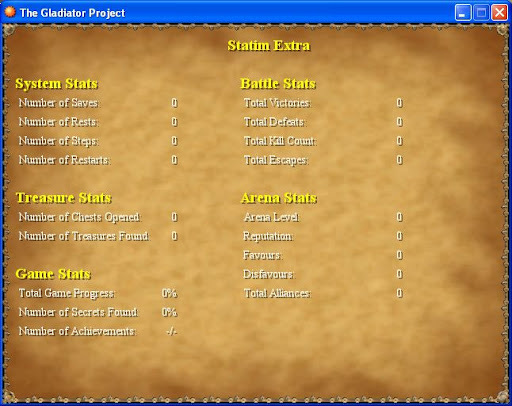 This is the main Menu Status window, where there are several options and submenus. Again, they are in Latinesque but with translations at the top. This screen does seem unfinished – and maybe it is – but at the moment I don’t know what else to put here yet, although I may put a centralised “random content” window here too. This is the window for extra in-game stats. For ages (in the RMVX version) it was left unfinished, but this is about 95% complete, as there are only a few more stats to add before completion. I guess that’s enough for now – lucky three! – so I’ll leave it at that. I’ll be putting a video demo up soon and then, after that, a playable demo.